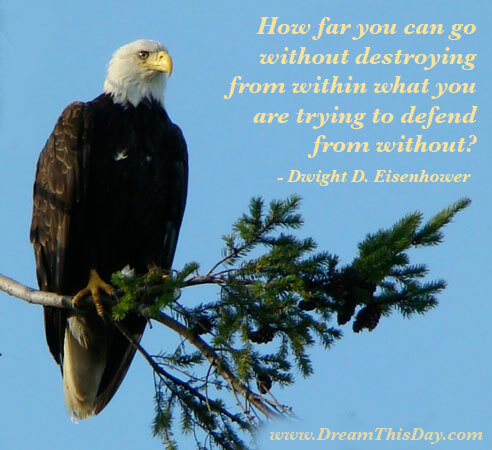 what you are trying to defend from without? The end does NOT justify the means. Freedom cannot be gained by sacrificing the freedom of others. Free speech cannot be gained by limiting the free speech of others. Human rights cannot be secured by trampling the human rights of others. Viciousness in others cannot be fought by becoming vicious oneself. injustice with injustice, prejudice with prejudice. Give to every human being every right that you claim for yourself. Give me your tired, your poor, your huddled masses yearning to breathe free. deserve neither liberty nor safety. among these are life, liberty, and the pursuit of happiness. is to demonstrate here that our democratic system is worthy of emulation.